Spring is in the air and that makes me happy! Papier-mâché letters make me happy too! 1. 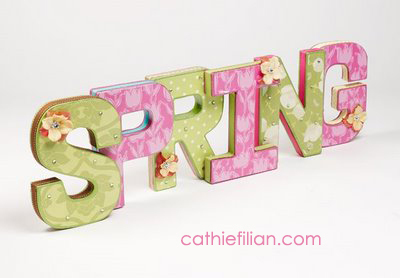 Paint each letter with 2 coats of either fresh foliage or rose paint. Paint the fresh foliage letters with 2 coats of extreme glitter peridot and the rose letters with extreme glitter hologram. Allow for dry time in between coats. 2. Trace the letters onto the back of the scrapbook paper. Cutout the letters. Apply Mod Podge to the back of the paper letters. Center on the painted letters, top coat with Mod Podge. Use your fingers to press out any air bubbles. Smooth your brush strokes. 3. Hot glue ribbon around the letters. Hot glue the letters on top of each other in a layered design. 4. Paint the large pink petals with extreme glitter gold. Allow to dry. Using hot glue, layer the petals, flower trim and rhinestones around the letters. Glue rhinestones to the letters in a random pattern. I love it! I can't seem to find the extreme glitter paint anywhere! Hi! It is just now beginning to ship...I think the glitter will be live online for retail very soon! I'll get the scoop tomorrow and post the actual dates. The glitter is my favorite new plaid product. Why do you paint the letters with paint and glitter if you're just going to cover it up with paper and ribbon? Am I misunderstanding something? The letters begin as a brown kraft paper - so they need a little sprucing up. You still see lots of glitter on the edges of the paper and on the side of the letter. I guess the pic is not close enough. Also, I like to paint/glitter the whole letter so that the surface is even before decoupaging. You could do just the edges, but with thinner paper the decoupage might appear bumpy.